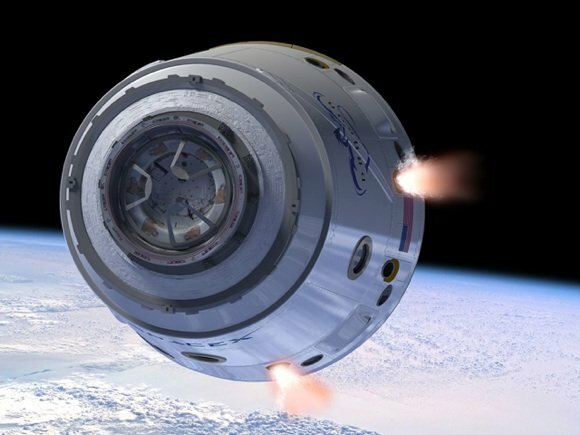 The plucky challenger has stated that its "Dragon" capsule is not merely capable of delivering supplies to the International Space Station: it is - potentially - also capable of carrying astronauts to the space station and back down to Earth again. In a statement released yesterday, Musk and SpaceX also make the bold claim that the Dragon, once fitted with modifications that the company is now developing under NASA contract, would also be able to land "almost anywhere on Earth or another planet with pinpoint accuracy, overcoming the limitation of a winged architecture that works only in Earth’s atmosphere" (our emphasis). There are other contenders for this work, of course. The Orion ship from NASA's now largely-cancelled post-Shuttle "Constellation" plan is still being built, though at the moment there are no firm plans for a man-rated rocket to lift it into space. Under a $75m NASA deal announced this week, SpaceX will fit Dragon with the only thing it lacks to make it safe to carry people - a so-called "launch abort" system. Launch abort is to manned rockets what ejector seats are to jet fighters; a way of firing the crew safely away from the craft in the event of a disaster and bringing them down to a safe landing. Rocket stacks, being basically huge lightweight towers full of explosives, are particularly dangerous during launch and so an escape system for astronauts is especially desirable during this stage of flight. Next page: It can land people on Mars... but how would they get back?